Does the Fiduciary Role Matter to Investors? As of March 1, 2017, the status of the Department of Labor’s new fiduciary regulation for advisors working on retirement accounts was in limbo. The DOL suggested a 60-day delay to host comments regarding the regulation, which calls for all advisors working with retirement accounts to act as a fiduciary, considering only the best interests of the advisor in making investment recommendations. The regulation was an initiative promoted by President Barack Obama to protect investors from advisors who would, in theory, take advantage of retirees by placing their retirement funds in products that produced more income for the advisor and was not the best investment vehicle for the investor. Forcing advisors to take a fiduciary role would theoretically prevent that from happening, although it was expected to increase costs for advisors to prove their performance met the fiduciary standard. For Spectrem’s Investor Pulse, more than 1,000 affluent investors were asked how they felt about the DOL regulation, starting with a question about how familiar investors are with the term “fiduciary”. Only 24 percent claimed to be “very familiar’’ with the term and 41 percent claimed to be “familiar”, putting 65 percent in the top two categories in the survey. Sixteen percent of investors claimed to be “unfamiliar” or “never heard of it”. Familiarity followed two lines of investors: males professed greater knowledge than females, and the wealthier the investor was the more likely they were not understand the concept. In fact, 91 percent of investors with a net worth over $5 million claimed to be “familiar” or “very familiar” with the concept. 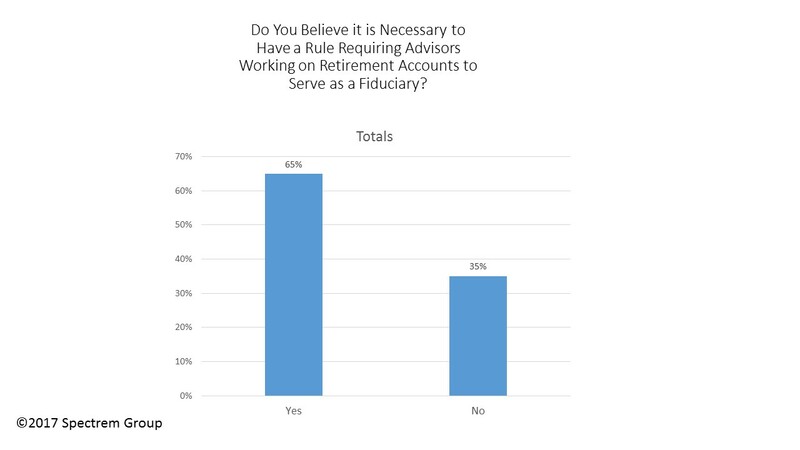 The investors were then asked whether they believed a fiduciary rule was necessary for advisors working on retirement accounts, and 65 percent said “yes”. In general, investors with greater wealth were more interested in seeing the regulation put in place than those with less wealth. The problem with the fiduciary regulation is that it is expected to cost advisors and providers more to perform advisory services. Keeping track of recommendations will cost procedurally, and advisors will be cautious not to recommend products or services that could produce a high commission if they cannot prove that product or service is in the best interests of the client. Investors then were asked whether they would be willing to pay more for an advisor who serves as a fiduciary, and the answer was significant. Asked to place their willingness to pay more for a fiduciary advisor on a 0-to-100 scale, the 1,000-plus investors placed their willingness at a remarkable low 39.19. Again, males and the wealthy were more willing to pay more, although even those with a net worth above $5 million placed their willingness at 48.75, still not at middle ground.